In the Frequently Asked Question section we have listed below the most common questions and answers for you to look through. We hope we have answered your question but if not please do not hesitate to get in touch and we will endeavour to answer your query. Torquay’s Dinosaur World is open all year round but see below for opening times for the summer and winter seasons. Saturday 30th March to Sunday 8th September. 11am – last entry 3.30pm – close at 5pm. Tuesday 10th September 2019 to Wednesday 25th March 2020. To make our entry prices fair to all we offer the same price of £5.95 to all visitors. Children who are 2 years old and under enter free of charge. Each visitor can also pick up a Paleo Pass, which gives unlimited FREE re-entry for 3 months and is explained below. Terms and conditions apply. Our Paleo Pass is a re-entry ticket that allows the named holder/s unlimited FREE re-entry for 3 months. Each pass will have an expiry date after which it will not be valid. The Paleo Pass is not transferable to other people, and can ONLY be used by the named holder as displayed on the Pass. The Pass can not be passed within families for visitors to use who are not named on the Pass. How long will it take to visit? Visitors can spend as long as they like in the exhibition. 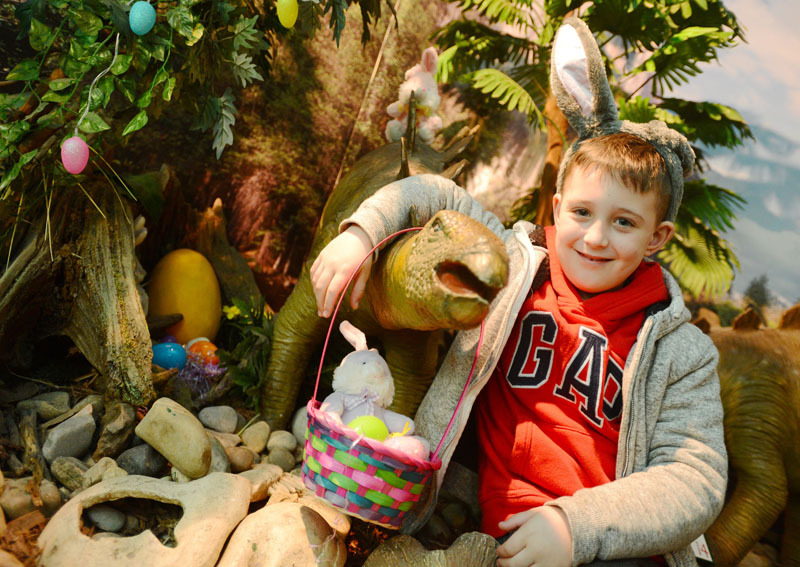 There are many displays to see, interactive areas to play with, a quiz to complete, and information boards with up to date details of a whole host of dinosaurs. As such the length of visit depends on how much each visitors wishes to read or interact. Having said that an average visitor time is about 1-1 1/2 hour. Is the Exhibition indoors or outdoors? Our exhibition is totally indoors, so is a great way to get out of the sun or stay warm and dry on rainy days. Don’t forget that we are open all year round. Do you have car parks? We do not have our own car parks, but there are three pay and display car parks within 5 minutes’ walk of our location. These car parks are located at Beacon Quay, Lower Union Street and the Meadfoot Road and further detail can be found on our ‘How to find us’ page. Is Dinosaur World suitable for pushchairs? Yes, the route around our exhibition is wide enough for pushchairs, but if you wish you can leave them with staff on entry and collect them at the end of your tour. However, we do have five steps up to a mezzanine level that contains a small section of the exhibition. We find that most people lift the pushchairs up the steps to view the scenes. Does Dinosaur World have disability access? 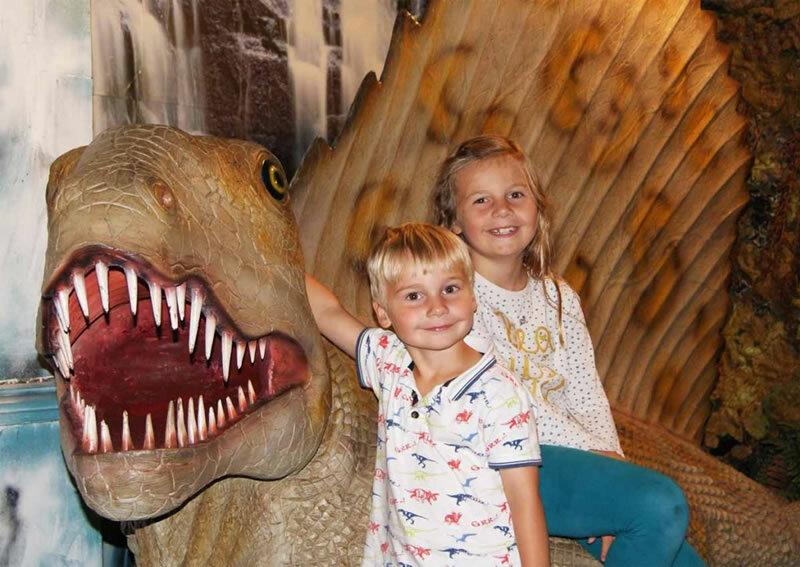 Torquay’s Dinosaur World is accessed from the pavement level, and the majority of the exhibition is fully accessible on this level so is suitable for wheelchairs. However, we do have 5 steps that go up to a side mezzanine level containing several scenes and exhibits. We offer a discounted entry price for visitors who may not be able to access this area. Unfortunately, our toilets are downstairs. Do carers and those that they look after get a discounted entry price? If you are a carer for someone you will both receive a discounted entry of £4.95 each. This price will also grant you the Paleo Pass re-entry ticket. (See above for details of the Paleo Pass). Do you allow photographs to be taken at TDW? 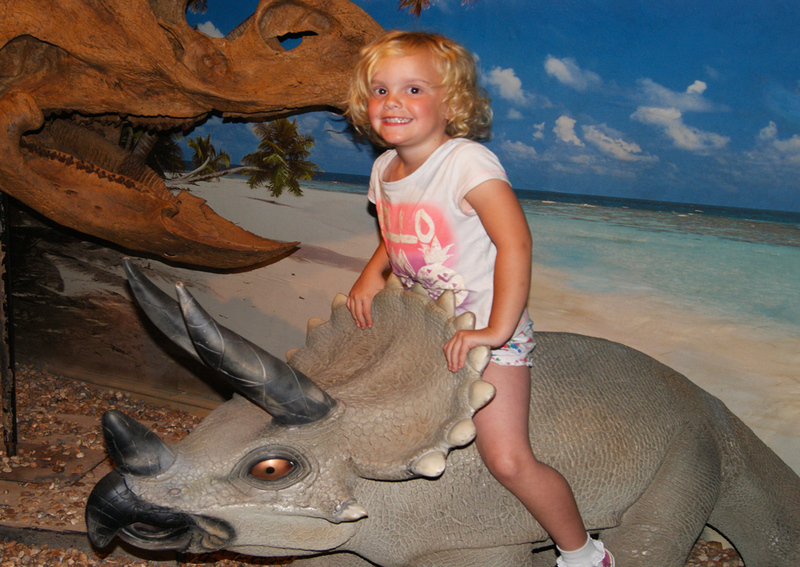 Absolutely, we encourage our visitors, especially the little ones, to take pictures or film of themselves with our dinosaurs and exhibits. We have a wide selection of dinosaur souvenirs for ages from 2 years old upwards. 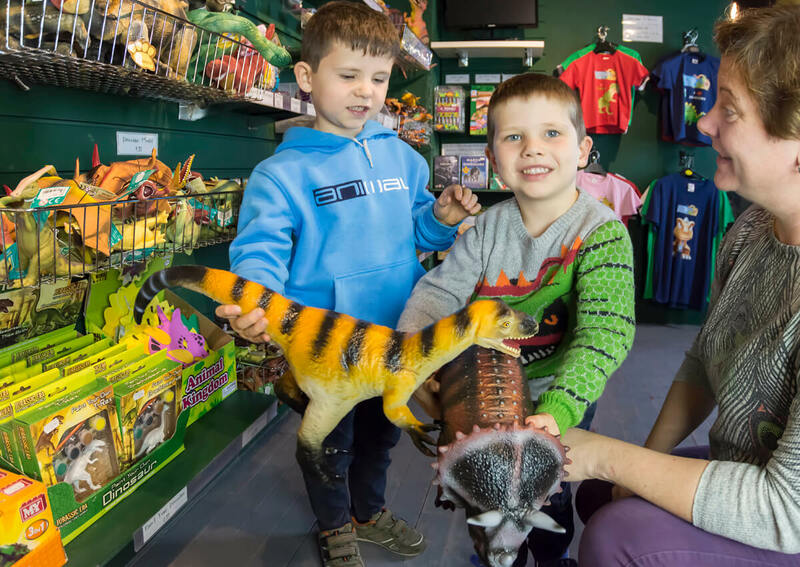 With a great selection of dinosaur models, hatching dinosaur eggs, real fossils, books, DVDs, Dinosaur t-shirts we are sure to have the perfect gift for your dinosaur fan. And don’t forget the Souvenir Shop is open to both visitors and non-visitors. Do you have anywhere to eat food? Unfortunately, we do not have an area to eat food, and we do not allow food to be eaten as visitors walk around the exhibition. Besides you are going to need your hands free for discovering all the dinosaurs and fossils! Are dogs allowed into the exhibition? Yes, but for the safety of all our visitors, dogs must be kept on a lead and controlled by their owners at all times.